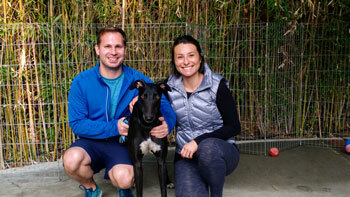 Maya and Thomas took Joker, now Benji, to his new forever home in San Francisco. They are planning to attend our SF meet and greets so Joker can see all his old friends and make some new ones. Have fun in the City by the Bay Benji. Let Their Last Race Be Into Your Life! 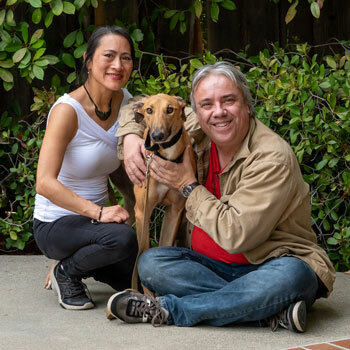 Wonder had a long day traveling from his fosters Leslie and Tom in San Leandro to Walnut Creek where Robert and Teresa met him, fell in love and took him to his forever home in Mountain House. There he will meet his new family, a Husky named Kato and cat named Zeter. Big day for all. Let Their Last Race Be Into Your Life! 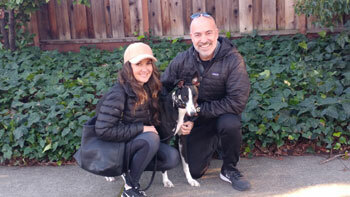 Michelle and Alex took a weekday trip to Walnut Creek to pick up their new addition Deuce, now Grimm. 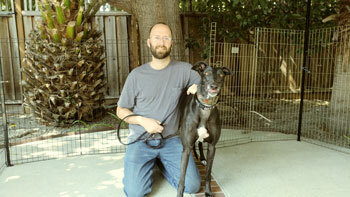 Grimm, the black greyhound, is now in his	forever home, in San Rafael, with Siren who is learning how to share. Siren doesn't like her brother, from a different mother, destroying the squeaker in the toys she has not destroyed yet. Let Their Last Race Be Into Your Life! Audrey and Graham are on their way home to SF with Gemma. If Gemma thought life was interesting so far wait till she sees what the city by the Bay will have to offer. Wonderful sights and sounds and regular meet ups with the other SF ex racers. Welcome Gemma. Let Their Last Race Be Into Your Life! 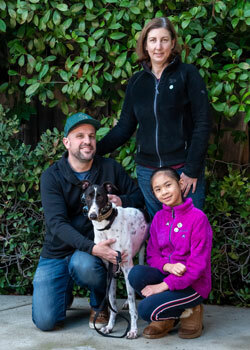 Tor and Rose are home with Char in Petaluma. Tor is involved in car racing so what a switch. Rose and Char will be in the stands while Tor is on the track. Let Their Last Race Be Into Your Life! Elizabeth and Alexander are home with Jack in San Francisco. 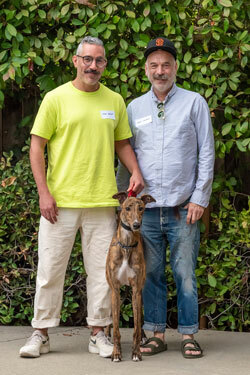 Jack cannot wait to introduce his new guardians to the other greyts at the SF meet and greets. Let Their Last Race Be Into Your Life! 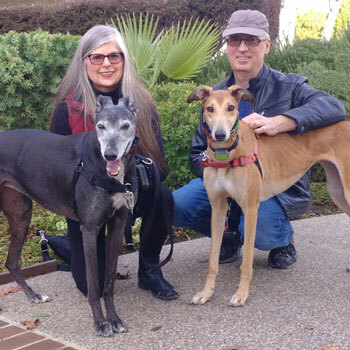 Anita and Daren had a conversation with their greyhound Paco, dog talk, and everyone agreed especially Paco, a female would be just what is needed. Penelope, now Charlie is having loads of fun in Oakley with her new brother and doggie cousins. Let Their Last Race Be Into Your Life! 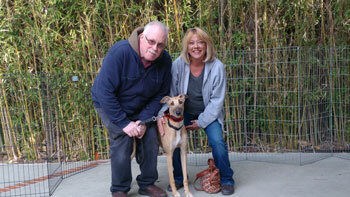 Irene, Michael and the family are on their way home to Brentwood with Dolly, now Gracie. 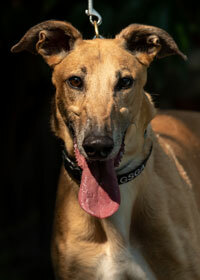 Gracie is the type that would thrive with a big family with kids and dogs to play with. 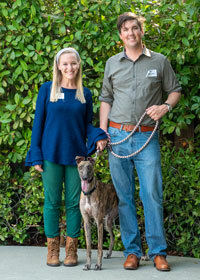 Well Gracie got the perfect family and they got the perfect greyhound. Let Their Last Race Be Into Your Life! Xirui and Alex failed fostering. Boy some of these fosters just can't give up a hound, but we knew that would happen, they didn't lol. 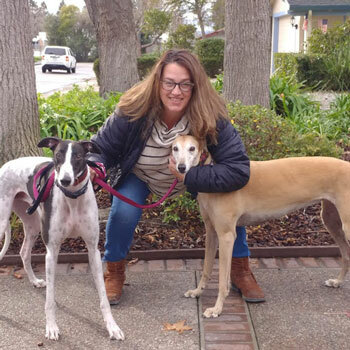 Tanker is home in San Mateo with his new sister. Do you think they like each other? I would say cheek to cheek means a big yes. Let Their Last Race Be Into Your Life! 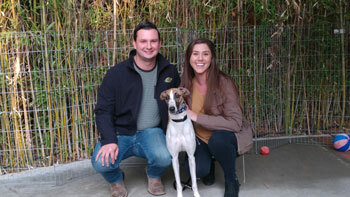 Seton and Chesely are thrilled to bring Cedar to his forever home in Walnut Creek. Cedar will enjoy all the friendly shops and dog friendly places in the Creek. Let Their Last Race Be Into Your Life! Kirstin and Susannah fostered King, now Owen. You guessed right, if they changed the name foster becomes adopted. 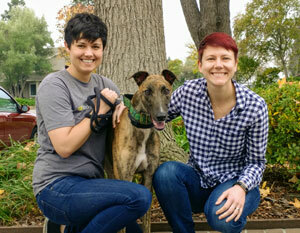 Kirstin and Susannah welcome	Owen to their pack in Oakland. Let Their Last Race Be Into Your Life! 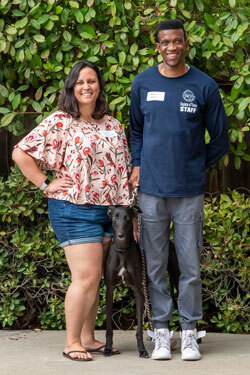 Elizabeth and Steve had room for another greyhound but did little Bruno approve. Bruno finally welcomed Flipper, now Franny with open paws as	did Bhodi who got a sister. Let Their Last Race Be Into Your Life! Color is never important but when the one you always wanted, a black and white, comes around and is good with small dogs and cats	and matches your Stabyhoun you have no choice. Gary and Laurie welcomes Dawn, now Zena. Let Their Last Race Be Into Your Life! 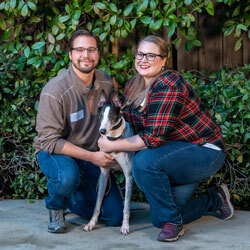 Catherine and Matt, fosters, volunteers and Greyt adopters are now introducing Gal, now Emma to their pack in Oakland. Did not take too much time to convince Matt he needed Emma. Let Their Last Race Be Into Your Life! Ariana and Randy are home with Ida, now Millie in Dublin. 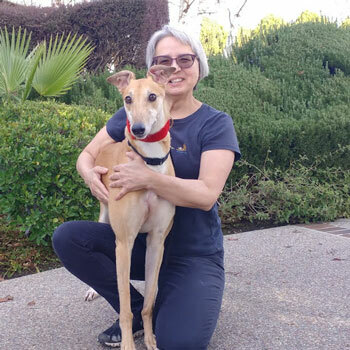 They will all have fun with many of our adopters when Eileen, our meet and greet host in Danville, organizes her weekly greyhound walks in San Ramon. Let Their Last Race Be Into Your Life! 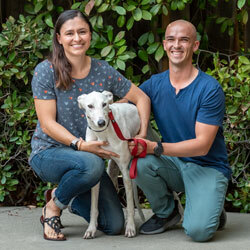 Alex and Michelle are home in San Rafael with their new ex-racer Scene, now Siren. Let Their Last Race Be Into Your Life! 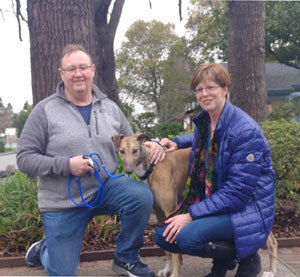 It was music to our ears when we heard that Joyce and George wanted to give Melody her forever home. 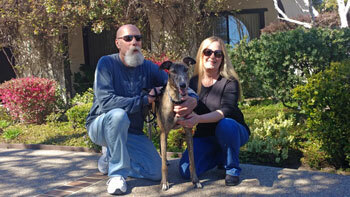 Melody is now	at home in Petaluma enjoying retired life and getting ready to attend our meet and greets. Let Their Last Race Be Into Your Life! 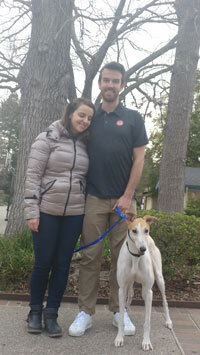 Deldi is home in Sacramento with WittleWascle. After a lot of debate Wascle is now Lola and we all agree the Kinks had something to do with it. Let Their Last Race Be Into Your Life! 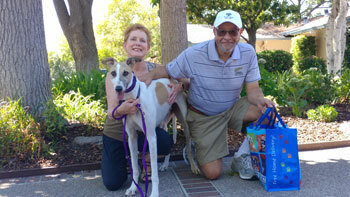 Jennifer a longterm GSGA adopter came up from San Diego to adopt Manny. 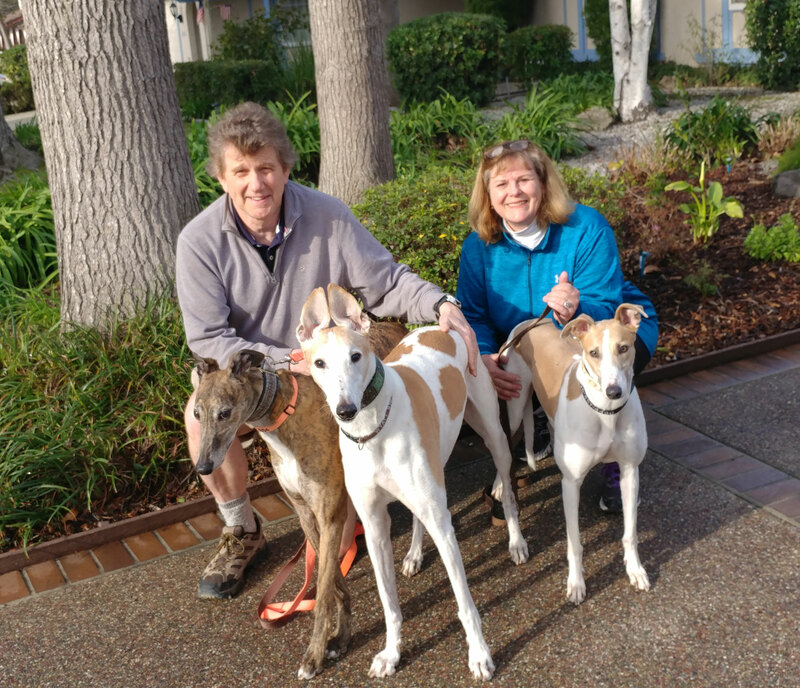 Manny, Jennie and her current greyhound Revvy will be enjoying the San Diego weather and the fantastic walks on the beach. Let Their Last Race Be Into Your Life! 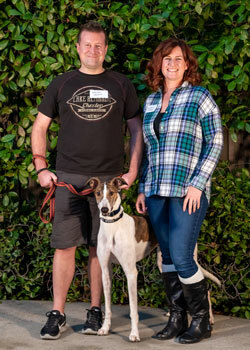 James and Michelle left with Lincoln and are now home in Fremont enjoying their new companion.. Let Their Last Race Be Into Your Life! Christianna and Alex are home in Dublin having fun watching Cora enjoying her retired life in her forever home. Let Their Last Race Be Into Your Life! John, family and Ella are all home together in Santa Clara. Let Their Last Race Be Into Your Life! James and Kristy are home in Walnut Creek with Dad, now Reuben. Let Their Last Race Be Into Your Life! Conner and Warwick will enjoy living and taking in the sites in San Francisco. Lots to do for a retired ex-racer. Let Their Last Race Be Into Your Life! 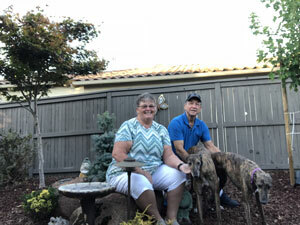 Steve and Gail are home in Alameda with Mr. Bones. 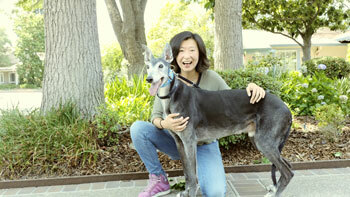 I know they will enjoy taking Mr. Bones on the weekly Alameda greyhound walks. Let Their Last Race Be Into Your Life! Alyssa and Kyle are home in Sacramento with Tyne, now Zelda. Let Their Last Race Be Into Your Life! 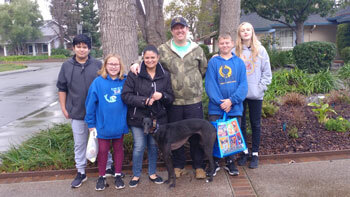 Jordan and family are home in Santa Clara with his best new friend Rosie, now Astrid. Let Their Last Race Be Into Your Life! 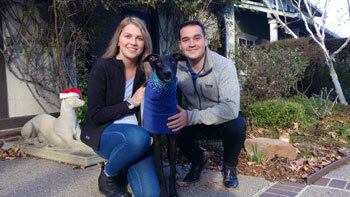 Walter and Danielle are home in Concord with Lowie, now Roland. Let Their Last Race Be Into Your Life! 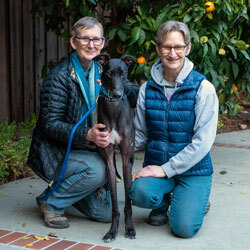 Lisa and Fran are home in San Rafael enjoying the antics of their new retired racer Margo. Let Their Last Race Be Into Your Life! Kirsten and Susannah both wonderful volunteers for GSGA are now proud guardians of King, now Owen. Let Their Last Race Be Into Your Life! 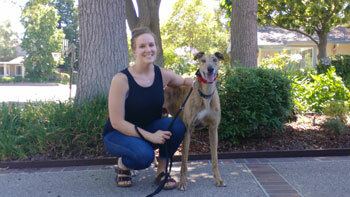 Ojai and Riley met Keeper, and agreed she is a Keeper. 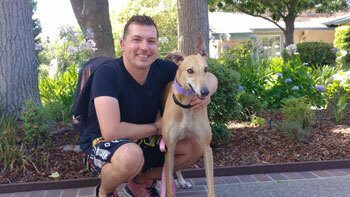 Keeper is now in her forever home in San Francisco Let Their Last Race Be Into Your Life! 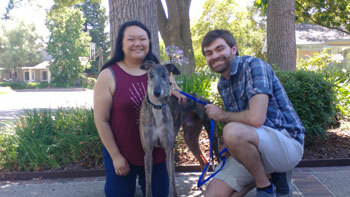 Jeremy and Allison are now home with Kanga, now Zelda, in Oakland. Let Their Last Race Be Into Your Life! 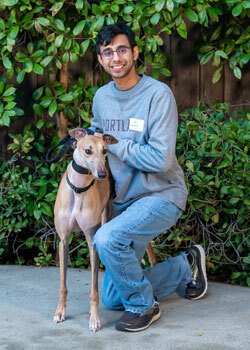 Vijay went home with Goldie to Sunnyvale. Let Their Last Race Be Into Your Life! Jonathan and Sara will be spending their New Years eve partying with Grim, now Gryffin. New dog New year Happy 2019. Let Their Last Race Be Into Your Life! 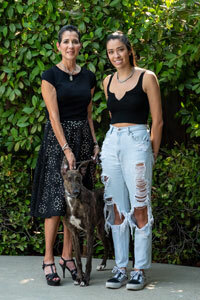 Rebecca and Angela are on their way home to San Jose with Trojan, now Donovan. 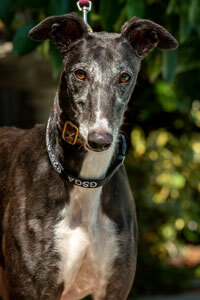 Julie their current greyhound will be home waiting to make sure Donovan knows who the boss is. Let Their Last Race Be Into Your Life! 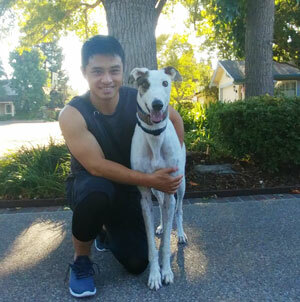 Kimberly is now home with Ondre, now Cody, in Castro Valley. What an exciting day for Kim and of course Cody who will spend his first Christmas in his forever home. Let Their Last Race Be Into Your Life! Far did not have to cry to loud to be heard. Far Cry, now Fanny, said to foster Karen I am not leaving, and so it goes. Karen has added	Fanny to her pack. Let Their Last Race Be Into Your Life! 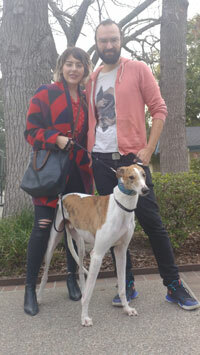 It was time for Kamille to get another Greyhound. 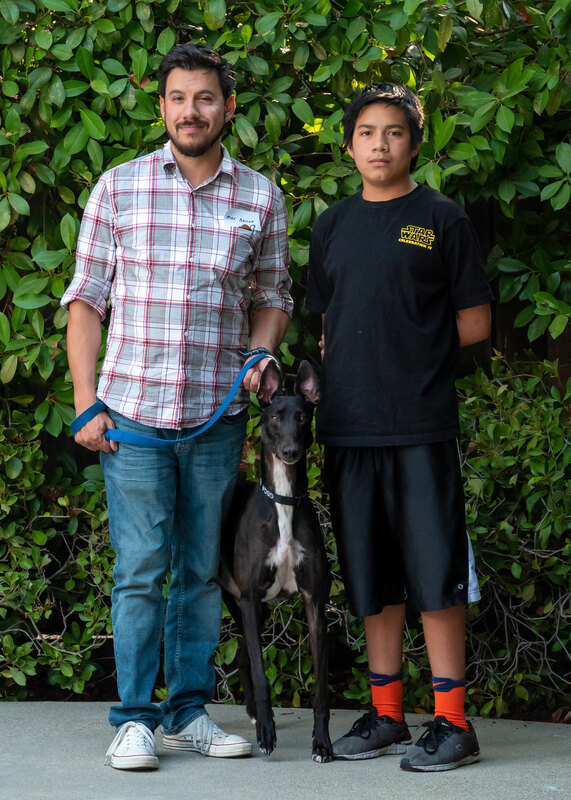 Kosmo is on his way to Salinas to meet his new hound family. Let Their Last Race Be Into Your Life! 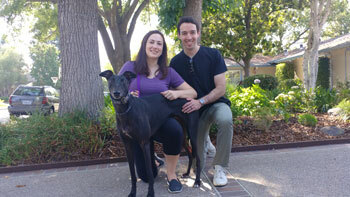 Rebecca and Sean and Sarina, now Maya, are home together in Danville. What a greyt time to adopt with Xmas around the corner. Another stocking for Maya please. Let Their Last Race Be Into Your Life! 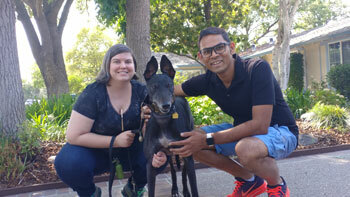 Vanitha and Laurence stopped by to adopt a special hound, Molly. Why special? Vanitha and Laurence already adopted Molly's, now Molli, mom. Mother and daughter are now reunited and living together in Moss Beach. Let Their Last Race Be Into Your Life! 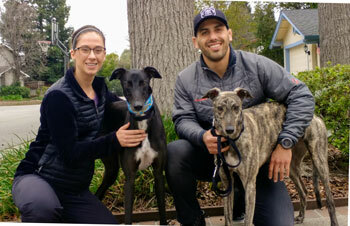 Julia and Evelyn could not wait to meet their ex-racer Rios. 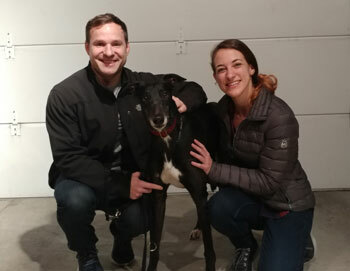 One happy hound and two happy humans are on their way to their forever home in San Jose. Let Their Last Race Be Into Your Life! 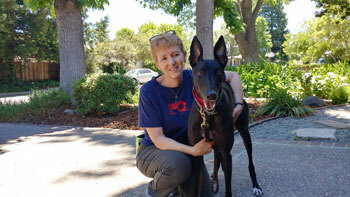 I heard there was a message from the Messenger, now Bruno, that he is having a greyt time with Debbie in Santa Rosa. Let Their Last Race Be Into Your Life! 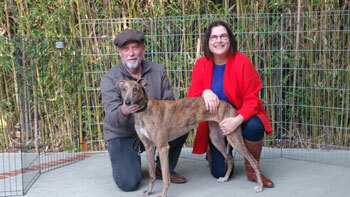 Linda and David will be bringing Iris home to meet Waldo their resident greyhound. We heard Waldo approves. Let Their Last Race Be Into Your Life! 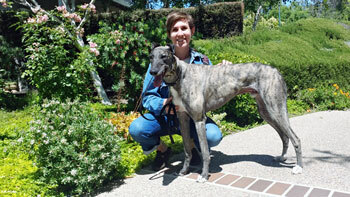 Gordon and Denise took Ghost, now Cody, home to Pleasant Hill. 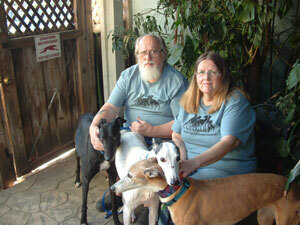 Gordon and Denise are prior adopters and Ghost will be new addition to their home. Let Their Last Race Be Into Your Life! Liz is on her way home to Mountain View with Tang, now Charlie. Let Their Last Race Be Into Your Life! Noah and Aubree are home in Hughson with Mercedes, now Mabel. 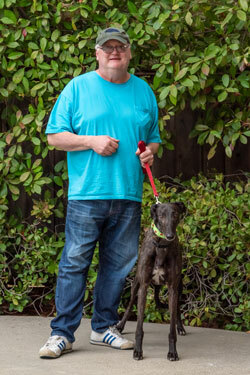 Mabel is their first dog, what a greyt dog she will become. Let Their Last Race Be Into Your Life! 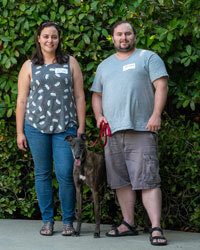 Jeffrey and Gabrielle came together from San Jose to adopt Hickman. 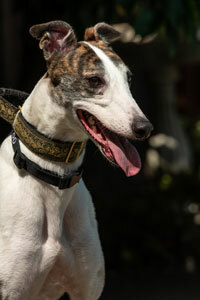 Jeffrey has had Italian Greyhounds before and now he has the real thing lol Let Their Last Race Be Into Your Life! 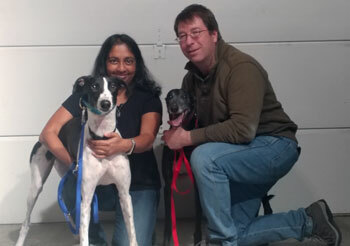 Lena and Alexandre are on their way home to Mountain View with Mandingo, now Ajax. Ajax is a set of cool Web development techniques so Lena is either into programming or named Mandingo after a Bleach Cleaner. I bet he may be going to work with Lena to help her program. Let Their Last Race Be Into Your Life! 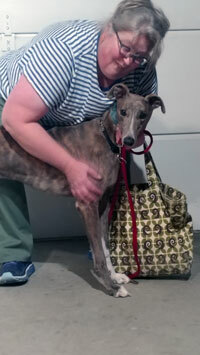 Fabienne is on her way home with Jewel, now Laguna Seca, Seca for short. 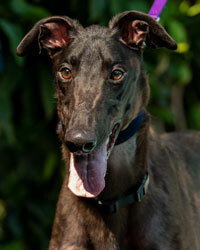 Why name a dog after a fast car, why not name him after the entire raceway? Let Their Last Race Be Into Your Life! 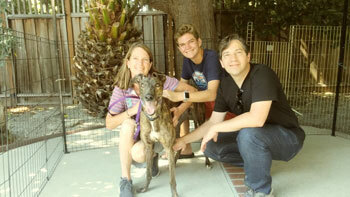 Celeste and Dave took their foster Lydia, now Libby, home to Discovery Bay. They were trying to foster, trying is the key word. Lydia is very happy her fosters failed. As Groucho sang She has muscles men adore and a torso even more so Oh Lydia Let Their Last Race Be Into Your Life! Alejandro and Bonnie left with McKitty, now Clyde McKitty. Do you think Clyde's name has anything to do with her mom's first name being Bonnie? Just saying. Clyde is now home in Brisbane enjoying the good life. Let Their Last Race Be Into Your Life! 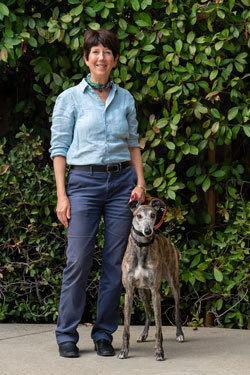 Lynn and Louie adopted one of the brood matrons (senior female who was used for breeding) the most wonderful of the hounds. Lamotte, now Layla is	retired and enjoing every day with Lynn and Louie. Let Their Last Race Be Into Your Life! 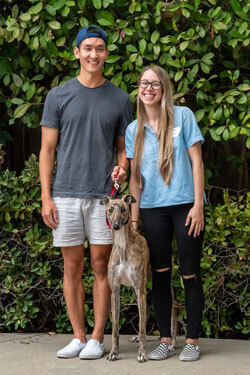 Amanda and Jimmy came to get their ex racing greyhound Dah Man. Dah Man will be going to his forever home in San Francisco. Let Their Last Race Be Into Your Life! It was a long day for Dacey but she was glad when Christine came to take her to her forever home in Campbell. Let Their Last Race Be Into Your Life! 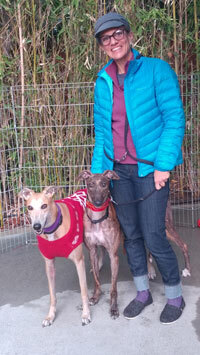 Leilani and Roland came to pick up Gilda to add to their pack. 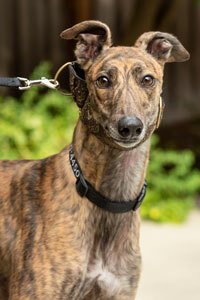 She is now in her forever home in Castro Valley. Let Their Last Race Be Into Your Life! 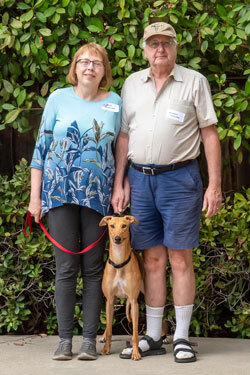 Frank and Nancy took home Elmer today, a special hound, to Healdsburg. Elmer had an accident at the farm and broke his verterbrae. Dr. Weir and wonderful specialists fixed Elmer and he is as good as new. 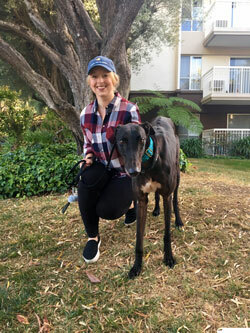 They are all home convincing Trina their resident hound she is still number one and she will be happy with her new brother LOL Let Their Last Race Be Into Your Life! 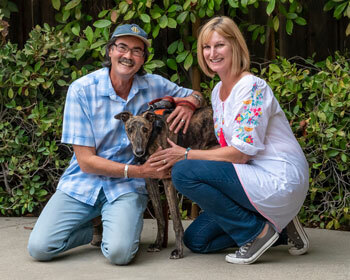 Ron and Kim were excited when they first met their new ex-racer Joni. Joni, is now resting after the long trip to Walnut Creek, at home in Petaluma. Let Their Last Race Be Into Your Life! Marie and Michael were thrilled when they finally met their sweet Joy. I know their home in Hayward will now be filled with happiness and JOY. Let Their Last Race Be Into Your Life! Todd and Carl will be bringing Kid home to San Francisco. 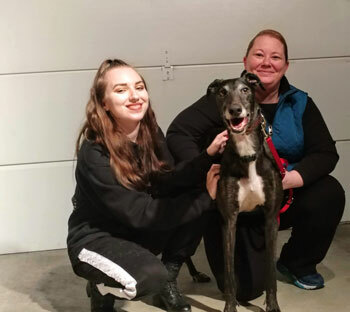 Their Greyhound Buddy passed after a wonderful 9 years and they are now ready to open up their home and give their new greyhound Kid a wonderful forever home. Let Their Last Race Be Into Your Life! 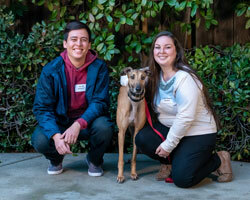 Ashley and Marcus were ready for adoption day and took Linus to his forever home in San Jose. Let Their Last Race Be Into Your Life! 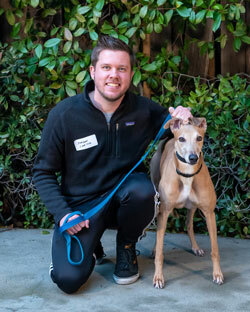 Josh came back to Walnut Creek from Washington to adopt Brick. Michael is waiting at home patiently ready to greet their new addition. 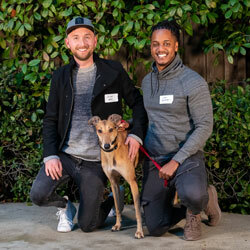 Josh and Michael previously had ex-racers from Golden State and wanted to keep it all in the family. Brick is now in Washington enjoying her new home. Let Their Last Race Be Into Your Life! 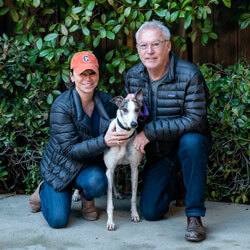 Lucia was ready with all the necessary supplies and then some, to make Ava as comfortable as possible in her forever home in Walnut Creek. Let Their Last Race Be Into Your Life! Susan thought she had this foster stuff down and adoption was not in the cards. Fostering an ex-racer would just be fine, helping the new hound to adjust and helping the adoption group, what more could you ask for. Then came Chanel. 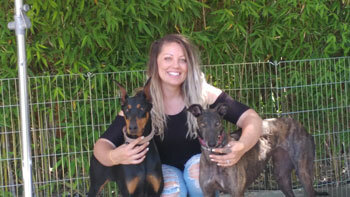 Susan is no longer a foster but the forever guardian of Chanel and Chanel has her forever home with Susan in Soquel. That's how the cards fall lol. Let Their Last Race Be Into Your Life! We could not find anyone more excited than Tim and Cathy when they came to meet Jacob. 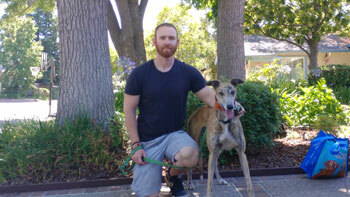 Jake is now in his forever home getting really spoiled by his new guardians in Sacramento. Let Their Last Race Be Into Your Life! Alan could not decide if his next dog would be another greyhound or not. After a little research and attending pet fairs only one breed rose to the top	as the best choice for his family. Yep another ex-racing greyhound. Charlie is home with Alan and Kimmy in San Jose. Let Their Last Race Be Into Your Life! 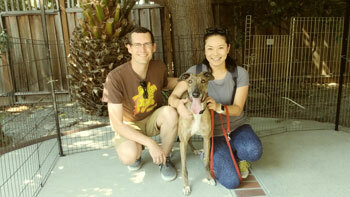 Karen adopted Run to add to her pack. Let Their Last Race Be Into Your Life! 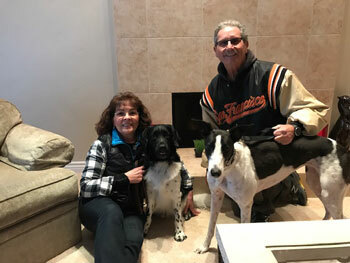 Ann and Vince took Bobby, now Von, home to Sacramento. As expected he did not just run but bolted right into the families hearts. Let Their Last Race Be Into Your Life! 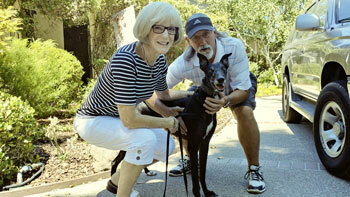 Lovin now Sheena was adopted by her foster family. Let Their Last Race Be Into Your Life! 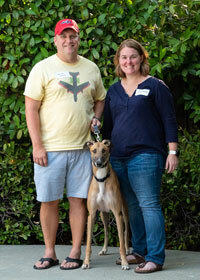 Gatsby was adopted by his foster family. Let Their Last Race Be Into Your Life! 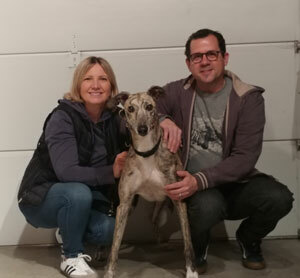 Farkel was adopted by his foster family. Let Their Last Race Be Into Your Life! 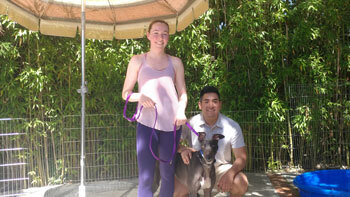 Kristin and Sourav fostered and dog-sat for Pierre. When Pierre's family was not able to keep him he went back to Kristin and Sourav. 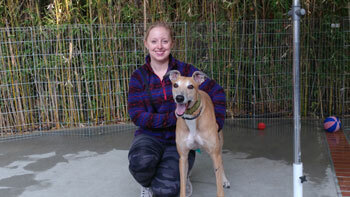 Well as	fate would have it Kristin and Sourav were in the market for another hound. 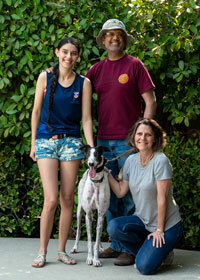 Pierre is not leaving and is now in his forever home with Kristin and Sourav. Let Their Last Race Be Into Your Life! Carolyn and Ryan are on their way home to Mill Valley with Jos. Let Their Last Race Be Into Your Life! Carolyn is heading back to Lincoln with Dolly. 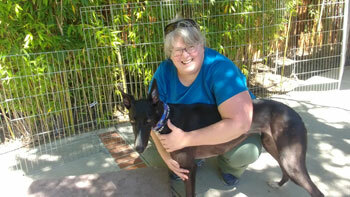 Dolly is a youngster and together, Carolyn and family will have lots of fun sharing all her new	experiences. Let Their Last Race Be Into Your Life! 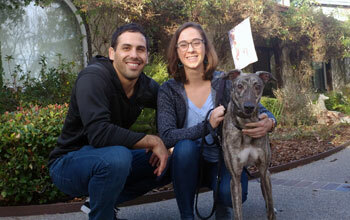 Marc and Sarah (the human) are on their way home with Sarah (the hound), now Rose, to Oakland. Let Their Last Race Be Into Your Life! Rebecca and Justin live in Salinas and that is real close to Carmel. Dan would enjoy meeting and getting petted by all the tourists homesick for their companions left home besides being in one of the most dog friendly areas. Let Their Last Race Be Into Your Life! 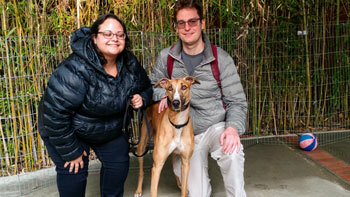 Chris and Mika are on their way home with Paradise to Alameda. 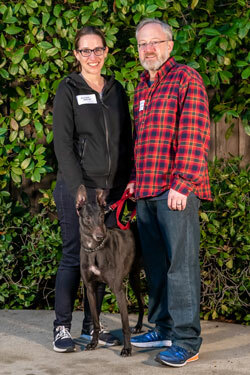 They will enjoy taking Paradise, now Gigi on the Alameda weekly walks and seeing all her hound friends at our Meet and Greet with Leslie and Tom.	. Let Their Last Race Be Into Your Life! Cain sadly had to be returned due to an illness by his loving guardian. 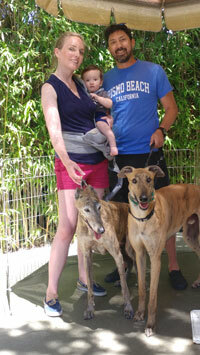 Yu is now going to make sure Cain has a wonderful new home	that he will share with Shader her current ex-racer. I am sure we will all see loads of pictures of both Cain and Shader on Facebook. Let Their Last Race Be Into Your Life! 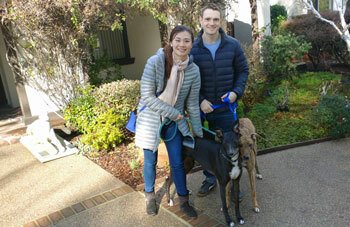 Carrie and Glenn are on their way home with Lauren to Menlo Park. . Let Their Last Race Be Into Your Life! 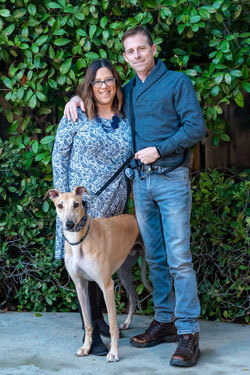 Sandra and Garry knew it was time for their next ex-racing greyhound. 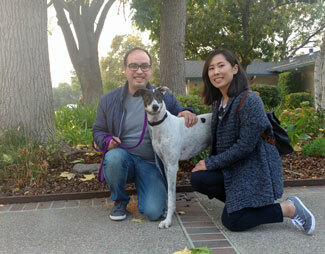 Cree is in her forever home in Turlock. Let Their Last Race Be Into Your Life! 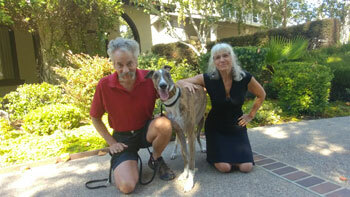 Jean and Aaron are home with Zippy, now Seti, in San Francisco. Seti is the Great one the real founder of the Great House of Ramesses. You can see Seti ( not the hound lol) in the Ten Commandments played by Cedric Hardwicke. Let Their Last Race Be Into Your Life! I guess Elizabeth can now be called a pistol packin mama. 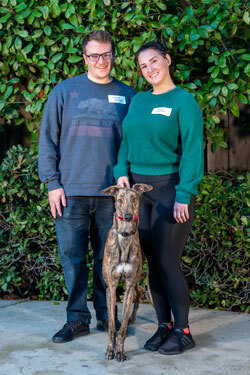 Pistol, now Sir Remington, Remy for short is now home with Elizabeth and Ryan in Cotati. Let Their Last Race Be Into Your Life! Laurie is now home in San Francisco with Daleen, now Autumn. Let Their Last Race Be Into Your Life! 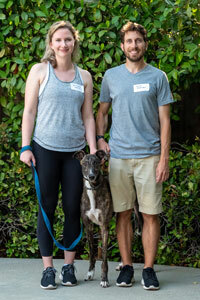 Laura and Dan are now home in Petaluma with Bowie. Let Their Last Race Be Into Your Life! 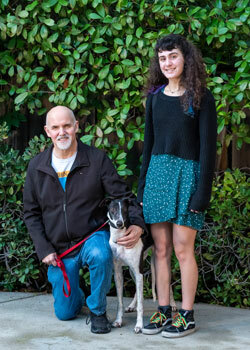 Sibyl and Kam are home in the cool and fun city of Santa Cruz with Lita, now Bean. Let Their Last Race Be Into Your Life! John and Lisa were ready to adopt in July. I guess you can call it Karma when your new ex racers name is July. All are enjoying the rest of the summer in San Jose. Let Their Last Race Be Into Your Life! Max is home in Fremont enjoying his Lulu, now Dakota. Let Their Last Race Be Into Your Life! 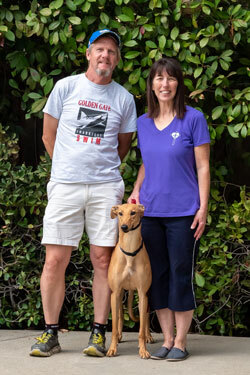 Patricia and Mark are with Ellie Mae, now Sponge, enjoying the cooler summer temps in San Francisco. Let Their Last Race Be Into Your Life! Rose and family are all together enjoying their time with Harley in Modesto. Let Their Last Race Be Into Your Life! Elizabeth and Scott came over to help us set up for the haul. I think they wanted a sneak preview of what was going to happen on Saturday. 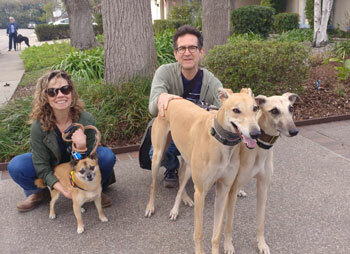 Well, they are so happy, Bryce, now Scout, is enjoying his forever home in Pleasant Hill. Let Their Last Race Be Into Your Life! 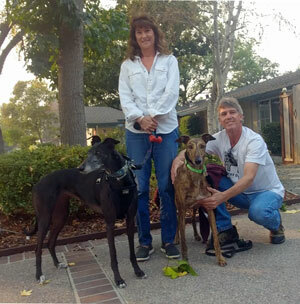 Janis and John have another ex-racer to show off at their Roseville meet and greets. Sparky now Sage is in her forever home in Sacramento. Let Their Last Race Be Into Your Life! 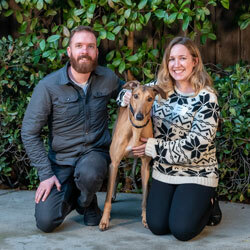 Kristen and Andrew will be bringing Hank their new ex-racer to their Oakland meet and greet along with Blew. Hank will be a great ambassador for GSGA, Blew is still wondering who is this new happy guy. Let Their Last Race Be Into Your Life! Jake figured it was the right time to add to his pack. Lexi, now Marvel, will now be home in San Francisco. Let Their Last Race Be Into Your Life! 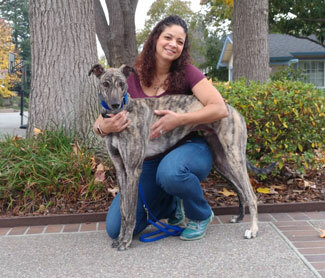 Christine and Thief, now Jasper, are now together and will be celebrating July 4th in Martinez. Let Their Last Race Be Into Your Life! Alyssa and Adin are now with Hobart in Sacramento. Let Their Last Race Be Into Your Life! 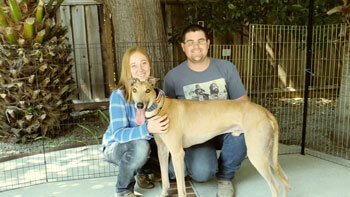 Kompound, now Penny Lane is with her forever guardian, Chris in her forever home in Livermore. Let Their Last Race Be Into Your Life! 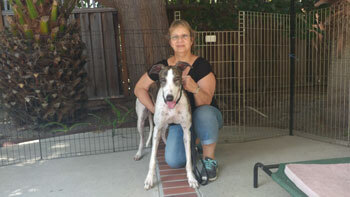 Heart, now Brave Heart, stole all our hearts and is now in her forever home with Marilyn in Danville. She will still see her foster family all the time so	its almost like she has 2 forever homes. Lucky hound. Let Their Last Race Be Into Your Life! Shallyn came and fell in love with Baby, now Lentil. 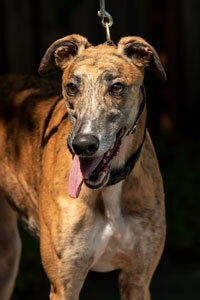 Lentil is now in Albany in his forever home. Let Their Last Race Be Into Your Life! Gregory and Tom needed a confident ex racer to enjoy all the action and noises of the City. 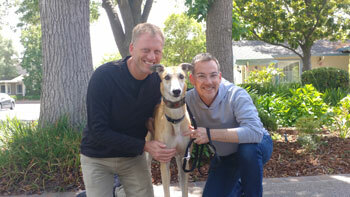 Gregory, Tom and Sovereign,now Kairos are home	together in San Francisco. Kairos is a Greek name meaning the opportune moment and it sure was the right time for everyone. Let Their Last Race Be Into Your Life! 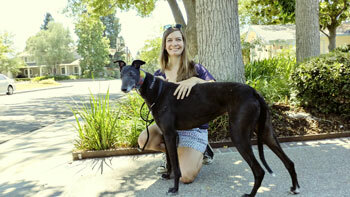 Ashley is ready for her next greyhound and so was her Dobie Freyja. Sweet, now Rhys, which means enthusiasm,	and she is enthusiastic, is now home with her family in Weeds. Let Their Last Race Be Into Your Life! 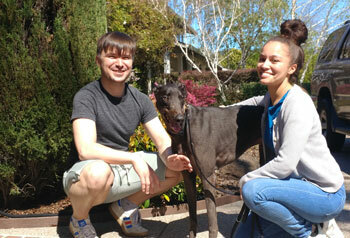 Kelly and Ben are taking their first ex racer Diane home to San Jose. I wonder how long it will take until	they figure it is time for their second. Those ex racers are like potato chips you know. Let Their Last Race Be Into Your Life! We figured out why people say greyhounds are expensive. First of all you can't have one since they are like potato	chips and they grow on you. 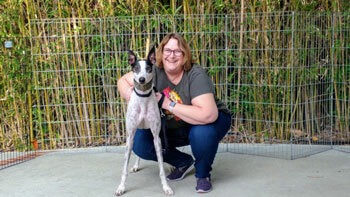 But it is not the greyhounds that are expensive ask Kathleen and Barna who just brought RAV,	now Jasper, home in their NEW car that was made for 2 hounds. Jasper and Piper are both enjoying their forever home and their new Subaru. Let Their Last Race Be Into Your Life! Kamille felt that emptyness in the house without a greyhound. 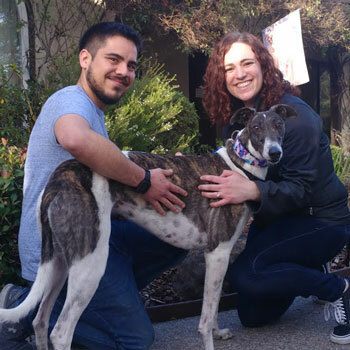 Welcome Julie, who is now in Salinas in her forever home bringing smiles to Kamille and joy to their home. Let Their Last Race Be Into Your Life! 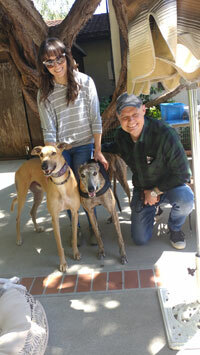 Elizabeth was so excited to meet her ex racing greyhound Lee, now Deacon. Both are now enjoying their time together	in Mountain View. Let Their Last Race Be Into Your Life!